On this week’s Social Media Marketing Talk Show with Michael Stelzner, we explore LinkedIn Audience Network with Viveka von Rosen, the Facebook Instant Articles and AMP WordPress Plugin with Leslie Samuel, Facebook Stories on the desktop, and other breaking social media marketing news of the week! If you’re new to the show, click on the green “Watch replay” button below and sign in or register to watch our latest episode from Friday, September 8, 2017. You can also listen to the show as an audio podcast, found on iTunes/Apple Podcast, Android, Google Play, Stitcher, and RSS. LinkedIn Officially Launches New LinkedIn Audience Network: LinkedIn announced the new LinkedIn Audience Network, “a native advertising network that enables you to reach even more professionals with your ads by placing your Sponsored Content on high-quality, third-party publishers across mobile and desktop.” LinkedIn assures marketers that it has “taken measures to ensure brand safety within [its] recently launched LinkedIn Audience Network” such as vetting partner publishers to verify that they meet its advertising guidelines and regularly monitoring campaign activity on the network. LinkedIn also promises to give advertisers control over where their ads appear within the network. LinkedIn announces new LinkedIn Audience Network. Facebook continues to expand Stories to more profiles being viewed on desktops. 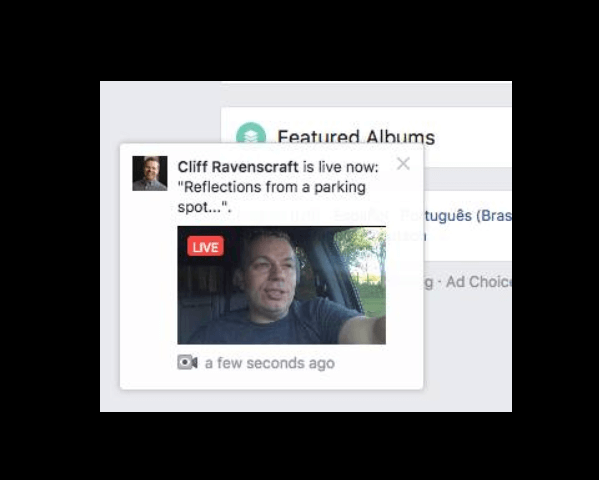 Facebook Features a Pop-Up Alert for Videos on Desktop: Facebook appears to be testing a pop-up alert for videos on the desktop. The alert shows up in the lower-left corner of the screen and plays the live video without sound as the user continues to scroll through the news feed. Facebook appears to be testing a pop-up alert for videos on the desktop. 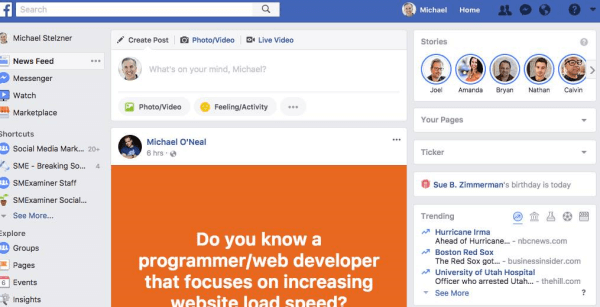 Facebook Adds Floating Call-to-Action Button on Posts: Facebook appears to be testing floating call-to-action buttons that are found at the bottom of the news feed as you scroll. 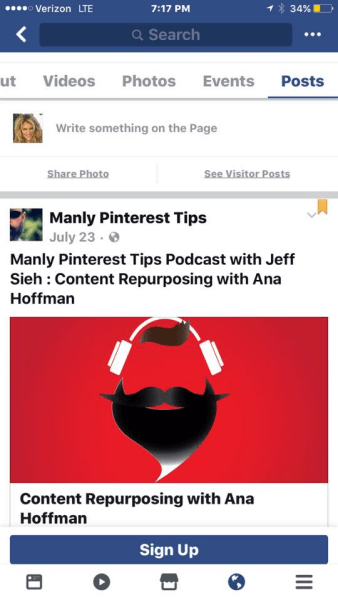 Facebook adds floating call-to-action buttons on posts. 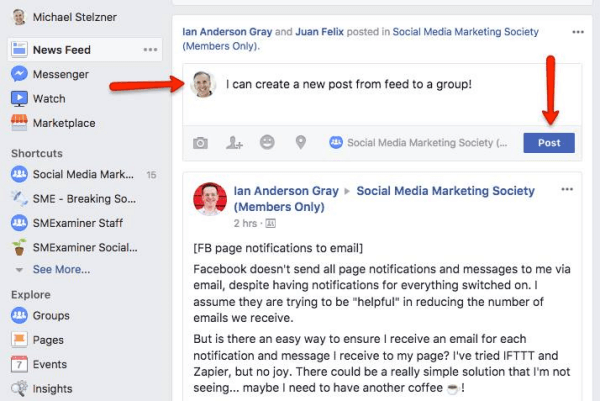 Facebook Allows Users to Directly Post to Groups From the News Feed: It appears that Facebook now allows users to post directly to groups from the news feed. Facebook now allows users to post directly to groups from the news feed. Facebook Tests Colorful Backgrounds for Comments: The Next Web reports that a new colored comments feature is being tested with “a small fraction of [Facebook] users.” This new feature allows users to post comments with colorful backgrounds and gradients that are similar to colorful variations now available for text-only posts and appears to be strictly limited to mobile for the time being. Google Adds New Features to Google Data Studio: Google rolled out several new features to the Google Data Studio including a new Data Studio Community Connectors developer program, which allows users to visualize data from any source. Google also added embeddable Data Studio reports for websites and apps, new data controls to simplify reporting, and more. 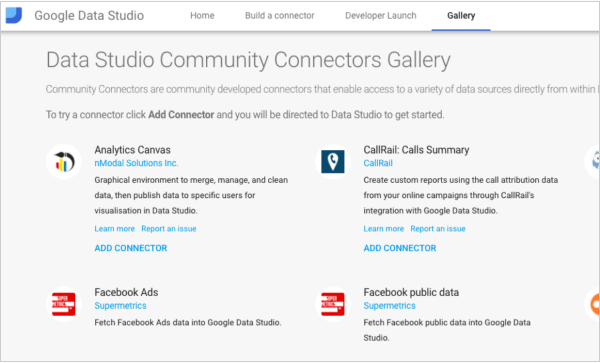 Google rolled out the Data Studio Community Connectors developer program, which allows users to visualize data from any source. 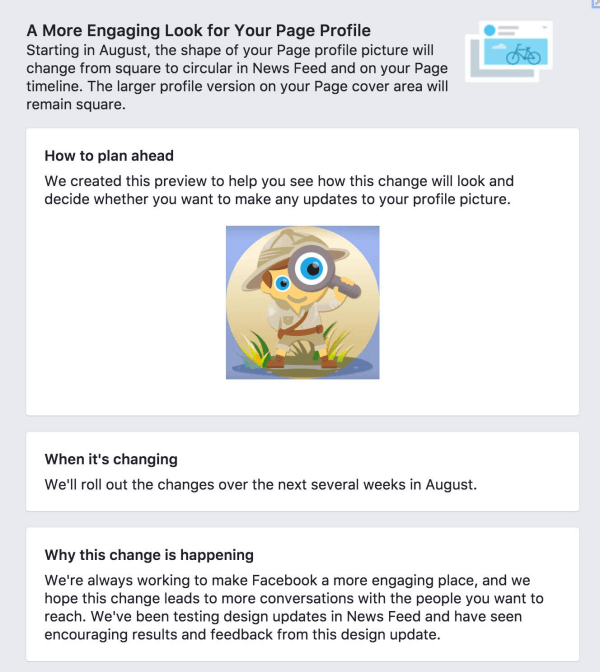 Facebook is changing page profile photos from square to circular. 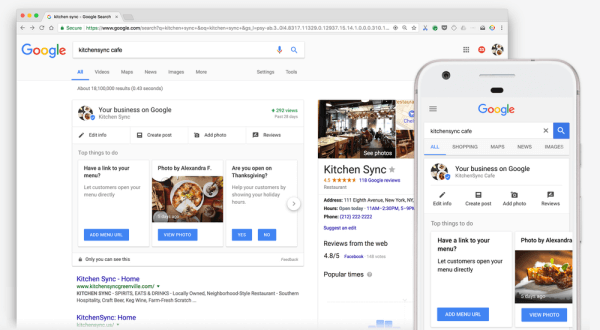 Google Rolls Out Dashboard to Manage Business Listings in Search: Google introduced a new “simple, easy-to-access business dashboard” found right in Google search. With this new tool, business owners can complete and enhance their listing in search, share photos and posts related to their business, and see how many views they’re getting. Google introduced a new simple, easy-to-access business dashboard in search. Facebook AI Researchers Train Bots to Mimic Human Emotion: In a newly published paper, Facebook’s AI researchers detail their efforts to train a bot to mimic the subtle patterns of human facial expressions, or “micro expressions,” using a series of YouTube videos of people having Skype conversations where each participant’s face was clearly visible. Mashable suggests that this early research may “one day have implications for Facebook’s efforts to improve avatars in VR” or help further the development of Facebook Spaces. In a newly published paper, Facebook’s AI researchers detail their efforts to train a bot to mimic the subtle patterns of human facial expressions. Facebook Offers Hundreds of Millions of Dollars for Music Rights: Bloomberg reports that “Facebook Inc. is offering major record labels and music publishers hundreds of millions of dollars so the users of its social network can legally include songs in videos they upload.” Under current law, copyright holders are responsible for asking Facebook to take down videos with infringing material. Although Facebook has promised to develop and build a system that properly identifies and tags music that infringes copyrights, the setup process is expected to take too long and both sides are eager to find a quicker solution for this growing concern. Facebook Officially Rolls Out Watch to All U.S. Users: TechCrunch reports that Facebook has officially opened the new Watch tab to everyone in the U.S. after a limited rollout a month ago and a further expansion to more users last week. The report confirms that the new Watch tab is now available across Facebook’s native mobile apps, desktop site, and TV apps. Facebook officially opened the new Watch tab across its native mobile apps, desktop site, and TV apps. YouTube Adds New Live Video Features: YouTube launched several improvements to the live video experience on the platform. 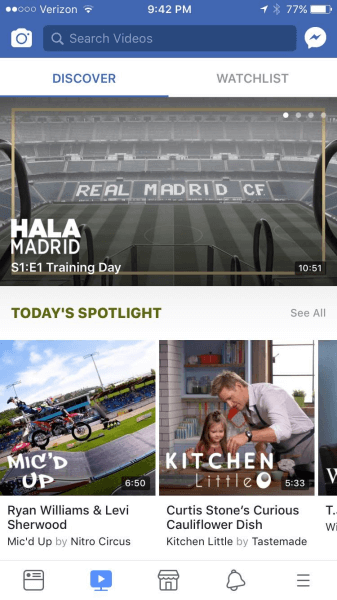 These updates include real-time interaction with ultra-low latency, which makes it possible to answer fan questions and get viewer input during your live broadcast “faster than ever before.” YouTube is also rolling out new chat moderation tools and the ability to more easily stream what’s on your screen directly to the main YouTube app on an iPhone or iPad. WhatsApp Announces Free Tools for Businesses: WhatsApp announced plans to build and test new business apps to help small companies using WhatsApp to communicate with customers. It will also roll out an enterprise solution for bigger companies such as airlines, ecommerce sites, and banks operating at a large scale with a global base of customers. Snapchat Expands On-Demand Geofilter Creation on Mobile to Europe: Snapchat users in the UK, France, the Netherlands, Denmark, Sweden, Norway, and Finland will now be able to create on-demand geofilters from their mobile devices through Snapchat Creative Studio. Snapchat rolled out this feature to the U.S. this past June. The Next Web reports that the on-demand geofilters will start at £5.99 (€6.99 in Europe, and in Denmark and Norway, 49kr and 65kr respectively) and can cover an area as small as a house (1800 square meters), or as large as 100 soccer pitches (450,000 square meters). Buyers can also choose to make them last for just a couple of hours or for a few days. Twitter Brings Night Mode to the Desktop: Twitter announced it’s officially rolling out Night Mode for its desktop site. This new feature initially debuted on the Twitter apps for Android and iOS and was being tested on the desktop site earlier this month. Night Mode on twitter.com appears to be widely available to all users now. Twitch Introduces Twitch Extensions: Twitch announced a suite of tools called Twitch Extensions that will allow streamers to customize their channel pages with interactive features including polls, leaderboards, schedules, overlays, virtual pets, and more. Twitch Extensions are now live for streamers and developers on the Twitch dashboard under the Extensions Manager or through the developer site. Amazon Designs Alexa Experiences Specifically Targeted to Minors: Amazon launched the first Alexa skills specifically aimed at children younger than age 13 in the U.S. These new skills will go live with a new Verified Parental Consent feature to operate within the terms and guidelines of child data protections such as the Children’s Online Privacy Protection Act (COPPA) and the FTC. Alibaba Debuts Facial Recognition Payments in China: TechCrunch reports that Alibaba is debuting facial recognition technology to facilitate digital payments and testing it at KFC fast-food restaurants in China.